This Monte Carlo Poker Set is very popular set for those looking for the upmost in quality and design. The chips of this set are produced from a composite resin and possess an insert that gives them the weight and feel of a heavy professional casino chip. This set includes 100 Monte Carlo Casino Poker chips that possess magnificent detail and a great look, weight and feel. 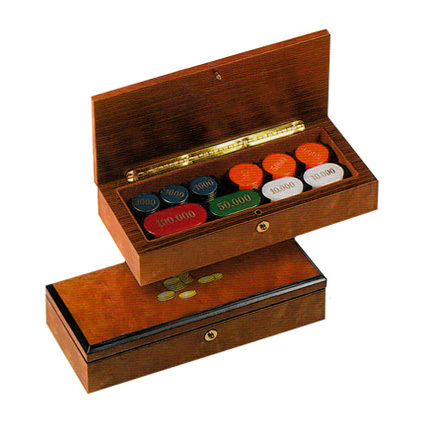 Your Poker Chips come protected with this handsome Italian High Glossy Briar Wood Case accented with 24kt. Gold Piano Hinges that will provide the most protection for your investment and a fabulous unique look that is made to impress. This multiplayer Poker chip set will ensure great lasting enjoyment with all your closest friends. Size: 9” x 3 ¼” x 2”.